The Samsung Gear Fit2 along with the Gear S3 and the S2 smartwatches proves that the Korean tech giant is starting to get a hang of making wearables you'll actually want to wear. It was also a bit of a step up from the original fitness tracker/smartwatch hybrid. It still has that crisp touchscreen display and sleek Tizen OS, but also throws in built-in GPS, automatic exercise tracking and recently added the ability to better monitor indoor workouts when you're working on those abs. Read this: Which Samsung Gear smartwatch should you buy? After giving it a throughout workout for our comprehensive review, we've been back living with the Android and iOS-friendly wearable to see if it's still a solid all-rounder. Whether you're thinking of picking one up or you already own it and want to know what it else it can do, here's our pick of handy Gear Fit2 tips and tricks to help you become the master of your Samsung wearable. Unfortunately, the Gear Fit2 doesn't support offline playback on Spotify like its Samsung smartwatch compatriots, but it will let you control features from your wrist. To do it, make sure Spotify is downloaded on your phone. Then, while still on your phone, head to the Samsung Gear app and tap 'Essentials' where you'll find a list of apps. Pick Spotify and download it for the Fit2. From there, you can listen to the music through Bluetooth headphones, skip songs, shuffle, repeat, save songs, search for workout music, access playlists by albums or artists and select recently played. Just make sure your phone's still around because the Fit2 needs the connection. If you'd prefer to go on a run and leave your handset behind, luckily you can pre-load some tunes on the Gear Fit2. Using the Gear app, select 'Send music to Gear.' You can pick specific songs or turn on auto-sync to pile on tracks from certain playlists. There needs to be music already on your phone - you can't transfer from a computer just yet. The Gear Fit2 doesn't pack voice control like the Gear S3 or Gear S2 smartwatches but there is a way to access your favourite app, whether that's monitoring caffeine intake or launching the heart rate sensor. First you need to go into the Samsung Gear app and go to Settings. Select Double press Home Key and assign the app you want to quickly launch. Simply double tap the home button (that's the smaller physical button) on the side of the Gear Fit2 and you're good to go. The good news is that you're not just stuck to one or two watch faces here. There's nine already pre-installed on the Gear Fit2 and it's really easy to change things up. Press and hold down on the watch screen and you'll be able to swipe through the different options. You'll then be given the option to stylise faces changing up colours and complications (widgets) if you prefer to have shortcuts to distance covered over step counts. You can install more from the Samsung Galaxy App Store but you'll have to do that from your phone first before syncing them back to the Fit2. If you're looking for a bit more from your companion fitness app, Samsung has recently introduced support for Under Armour's collection of apps including Record where you'll also get MyFitnessPal integration to track food. Head to the Galaxy App store through the Gear Fit app, search for Under Armour Record and hit the download button. You won't regret it. Widgets pop up when you scroll left to right from the home screen of Gear Fit2. Sometimes the order isn't really optimized for your needs - but it's pretty easy to customize. Scroll left to the widgets then long press the screen. The haptics will kick in and you can start picking which ones you don't want by tapping the minus symbol, adding by choosing 'Add' at the end and drag current widgets to move them. The last one can be kind of hard to do on the small vertical screen, but we've found that holding and moving the widget up and around the other is best. You can read all the messages you get on the Fit2 but you can't actually type anything back. However, there's a list of pre-set messages Samsung provides - and you can add your own to the list as well. To do so, you'll need your Android phone again. Open up 'Settings' and then 'Quick Messages.' From here, you can add or delete from two lists: quick responses and call-reject messages. Press edit or the plus symbol for your own list of customized messages. 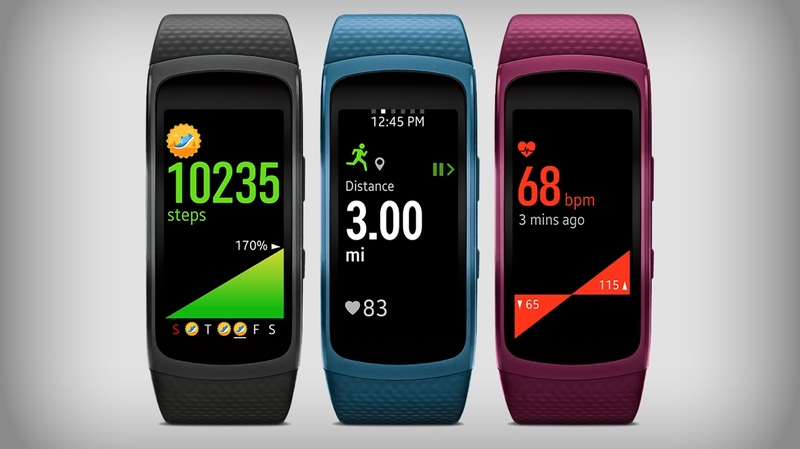 Samsung S Health is quickly improving, giving you more scope to check in on your data. It's important though to get the basics right and update it with your most current info (age, weight, height, exercise frequency etc). This will ensure the sensors on board and the data they record are as accurate and insightful as they can possibly be. This is also a place to set training plans, paces and goals you can set to use with your Fit2. You can turn on continuous heart rate tracking for a complete look of your heart on a 24-hour basis (with some caveats also previously stated) or you can manually take your heart rate. For tracked workouts, heart rate monitoring kicks in immediately. Whichever way you want to do it, you can also tag heart rate each time you use it. That way you can keep track of what's what in your 24-hour log. There aren't a lot of options to choose from - in fact there should be an option to voice-input your own tag, but for now there's a preset list of choices. Together is a feature recently added to S Health that's made its way onto the Gear Fit2. With it, you can complete step challenges against friends. There are also leaderboards you can check to make sure you stay on top. To enable the feature, head to S Health and select 'Manage items'. From there, scroll to the far right on top and enable the app to send SMS messages. Not allowing this will close the feature and you won't be able to use it. Choose some friends, then get stepping. It's easy enough scrolling to find your favourite app in the widgets section or apps list, but you can also create a shortcut with the home button. Just head to the Gear app on your phone, tap Settings and pick the one you want. After that, just double press the home button to open the app. While it might not make it obvious, the Gear Fit2 does actually monitor sleep automatically. But you need to make sure everything is set up correctly in the S Health app to make it happen. If you have an iPhone, you might find it difficult to do, but it works perfectly fine in the Android app. Launch the app and go to the More section and select 'Manage items'. Here you'll be able to toggle on sleep tracking. You'll also need to register your device to create the connection between the phone and Gear Fit2. Now you can nod off, and when you sync the data it'll be displayed in S Health detailing aspects about your sleep. Head to the settings gear on the Fit2, tap 'Connections' then Bluetooth. Make sure your headset is ready for pairing (usually holding down the power button) so it will show up on the Fit2. Once the name shows up, tap it and you're ready to start listening to music from the wearable. The Gear Fit 2 can manage to muster up to three days of battery with the power saving mode enabled, but in general will get you through a couple of days of tracking before you're clipping back into its charging cradle. There are some easy ways to help it push a little closer to those three days. The first thing to do is to turn off automatic data syncing to S Health. That's a big drain on battery. You can do that by going to the S Health app, heading to Settings and then Account to toggle off automatic syncing. You can also turn off the always-on watch mode, decrease the brightness from the dropdown menu (swipe down on the watch screen) and limit the notifications you want to be alerted about. This can be adjusted in the Notifications menu in the Gear app. When your Gear is on the fritz, you can reset it in a few simple steps. There are two different reset methods available: light reset, which deletes all data except media files and personal data; or factory reset, which resets all settings to the factory default values and deletes all data. Both options can be found in the settings icon on the Gear Fit2. If you can't even access the Fit2, backup and restore from your mobile phone through the Gear app's settings. It seems as if one of the tiny gold contact pieces has fallen out preventing the watch from connecting to the charger. Any idea on how to or if it even can be fixed?